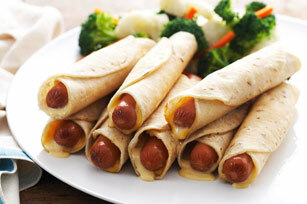 Hot dogs are the perfect shape for these easy-to-make classic flute-shaped tortilla wraps. Go ahead, try something different from the typical hot dog in a bun! Place 1 Kraft Singles and 1 hot dog near edge of each tortilla; roll up. Heat oil in large skillet. Add tortilla roll-ups; cook 8 min. or until evenly browned, turning occasionally. Serve with fresh fruit and cut-up fresh vegetables to round out the meal. Serve with your favourite salsa. Rolled-up tortillas can be secured with wooden toothpicks to prevent them from unrolling when being cooked. Or, you can warm the tortillas before using to help prevent the flautas from unrolling as they cook. Just wrap them in a damp paper towel and microwave on HIGH 1 min. or just until warmed, turning after 30 sec.